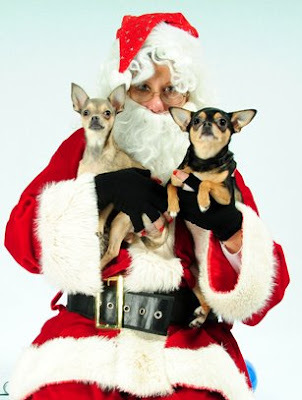 Last Saturday Alex and I took the girls (Lola and Penny) to a benefit for BARC animal shelter where we had their holiday portrait taken by Sit Pretty Photos. OK, what does this have to do with mens grooming? I had no idea Santa was a nail polish diva! I mean check out Santa's lacquer. He is rocking some serious NARS Jungle Red nail polish that would make even Diana Vreeland proud. You go girl! Haha. Penny and Lola are adorable. Thanks for coming out and taking part in the fundraiser/pawty.